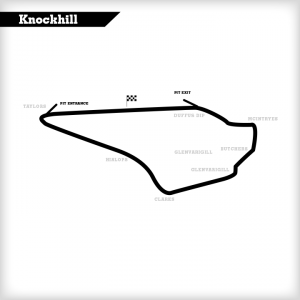 I having been fortunate enough to race at Knockhill a few times in a CSR Caterham and a 106 GTI. I really enjoy putting myself and the car through this challenging circuit. Trying to find a dry day is harder, but this might help you first-timers on track. The circuit begins at the highest point, just crossing the start/finish line to face Duffus Dip. A blind entry to a fast section of right, left then hard on the brakes into Mcintyres, bouncing over the first set of kerbs, before keeping the car central at the next right-hander. Always be aware of overtaking here and launching down the inside. Next is a brief dip down into Butchers, which sets up my favourite corner, Glenvarigil. Entry to this is complex – you need to take it confidently as it’s again a blind corner, but the car just needs to be delicately moved through. No need for heavy braking, just a lift as you go over and firmly on the throttle as you come out of the corner, trying to take as much speed with you. Coming up to Clarks, you need to brake hard, keeping far right as possible before hitting the apex. Do not get on the power before, otherwise you will end up on the grass. However, this is a hugely important corner as Hislops is an opportunity to slip stream and overtake. The entry to Taylors is bumpy, but brake as late as possible, keeping to the left and taking a very late apex before heading back up the hill to the start/finish line. This is a fantastic circuit that leaves your heart in your mouth every lap.